Inspired by travel, this new calendar takes you to a place of daydreams and positive vibes. 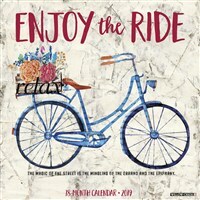 Each month features paper collage-style artwork that will lead you on a year-long journey of enjoying the ride! The large format wall calendar features six bonus months of July through December 2018; daily grids with ample room for jotting appointments, birthdays and reminders; moon phases; U.S. and international holidays. Printed on sturdy, high quality stock.